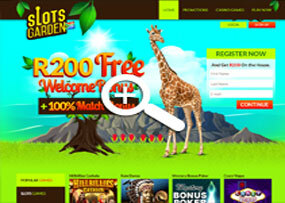 Slots Garden is a New is a New South African Casino Online. Slots Garden is a South African RTG Casino that was launched in late 2017, and has a refreshing garden atmosphere. Players from most countries are accepted, including USA and Canada. Players can access the Download version with over 150 games including Progressive Jackpots and Tournaments, or the Instant Play Version offering over 50 games. Slots Garden is compatible with mobile devices with operating systems Android and iOS Apple. VIP Members at Slots Garden get access to additional perks, prizes, and rewards. Slots Garden ensures a simple, safe and player friendly gaming environment. Slots Garden is owned and managed by the Virtual Casino Group. R200 Free No Deposit Bonus which will be credited automatically after opening a Slots Garden Casino account. Slots Garden uses Real Time Gaming which is a trusted and well-known software group featuring state-of-the-art games. Established in 1988, RTG still produces exciting games and software with a unique feel, high definition graphics and animations. RTG has a wide range of games including and all the latest progressive Jackpot slots. Visa, Mastercard, BitCoin and ecoPayz are accepted by Slots Garden. Because Slots Garden Casino is powered by Real Time Gaming, players will find a great selection of the most popular casino games. The majority of the games are made up of slot machines which include Classic Slots, Video Slots and the unique Six Reel video slots. All the casino games can be played in practice and real money mode. Bank on It, Cash Bandits 2, Diamond Mine, Popinata, Purrfect Pets, Secret Symbol, White Rhino and others. They have also recently released some New Slots called Asgard which offers 4 different Bonus Features, Fu Chi Slot which celebrates the Chinese New Year and Fantasy Mission Force Slot which Features Jackie Chan himself. Customers can contact the support team all day, 7 days a week, all year round. Slots Garden Casino has shown a lot of potential aiming to reach further heights. Participate in the exciting weekend bonuses with excellent rewards!